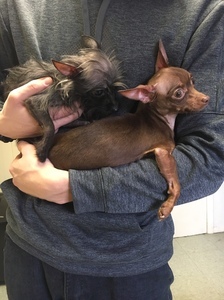 A Ridgefield resident found these dogs roaming in the southern Westchester County area. Although these dogs most likely are from out of state, we are hoping the owner will see this post through social media. Chocolate Brown female chihuahua, no chip, no collar and salt and pepper wire haired chihuahua female, no chip, no collar. Anyone with information about the dogs, please call Animal Control at 203-431-2711.